Do a news search for “pit bulls” and you’ll notice certain themes: neglect, dog bites, as well as proposals to ban them. No type of dog arouses more emotion than those identified– and misidentified– as Pits bulls. Yet a century ago, these dogs were so admired for their loyalty and bravery that they were considered “America’s Dog” and used on posters during World War I to sell war bonds and recruit for the U.S. military. Before that, Pit bulls were prized for their gentle disposition and willingness to watch over children whose parents were busy at work, in the fields. So how did a dog which was once respected become so feared? LaFontaine explains that during the era of slavery, “Attacks by Bloodhounds were common because Bloodhounds were used to track runaway slaves. They were used to doing something violent. Fast forward to the 1880s and New York City, where Newfoundlands were being used to guard markets, so a preponderance of bites came from Newfoundlands. After World War II, Dobermans were associated with Nazis and were seen as dangerous. Some may ask, what positive traits does a Pit bull have? Once again, history provides answers– and some surprising examples of great, if not heroic dogs. The only dog ever to be promoted to the rank of “Sergeant” started out as a brindle puppy with an abbreviated tail, a trait which inspired his name, “Stubby”. Stubby, who learned to salute other soldiers by touching his right paw to his eye, served as the mascot of the 102nd Infantry, 26th Yankee Division. When his Division was ordered to war, Stubby was smuggled to France aboard the SS Minnesota. Ironically, Stubby’s first injury ended up making him a valuable asset on the field; after being exposed to gas and becoming ill, Stubby was acutely sensitive to it– a skill which came in handy during a pre-dawn gas attack, which occurred when his Division was asleep. Stubby barked and nipped at his men, waking them and thwarting the attack. Pit bulls were used on World War I-era posters to promote war bonds and recruitment. Later, when a German spy tried to map his camp, Stubby was there. The German soldier tried to greet him, and Stubby responded to his overture by barking. The spy ran and Stubby attacked him until reinforcements arrived. Stubby’s capture of an enemy soldier resulted in his promotion to the rank of Sergeant. Later on, when his master J. Robert Conroy started law school at Georgetown University, Stubby– not the iconic bulldog we associate with the Hoyas today– was there. Some even say that Stubby may be the genesis of the half-time show, since he often delighted spectators by nudging a football around the field with his nose. Despite the breed’s impressive history, there is a perception that dogs like Sergeant Stubby are different from the Pit bulls we see today, on the news and in our neighborhoods. While indiscriminate breeding by unscrupulous humans has adversely affected the breed, Pit bull heroics are not a thing of the past. In 2001, three Sacramento-based Search and Rescue dogs named Tahoe, Cheyenne, and Dakota worked indefatigably at Ground Zero to find survivors; that was just one of the 200 missions the trio of Pit bulls have completed. 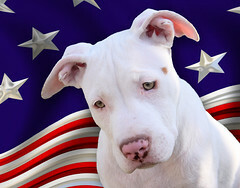 Despite negative press, threats of Breed-specific legislation and their status as outcasts, America’s dog still lives to serve. Dogs: Good for Irving Street and D.C.
As the accidental “parents” of our son’s pit bull, we raised her and learned much about this kind of dog. She is now a mellow 9 years old, sweet and loyal, but as a youngster she had enough strength and energy, for which she was bred, for 2 or 3 dogs, or people! Raising her was like having a 2 year old kid in the house for about 5 years. Our sons moved away to get their educations, we retired, and had the time, energy and devotion to care for her. However, I always find it ironic, when out in public with her (she was taught and learned good manners around people and other dogs) that so many young people, those whose lives are precarious in every way as far as jobs, time, homes, neighborhoods, resources and yes, maturity, are concerned, will say “Oh, I used to have one of those”, or “I’m going to get one of those.” I wish more of them would volunteer with me at our local animal shelter where nearly 50% of the dogs we get are pit bull mixes (more an appearance and body shape than a true breed). Very few are even full grown, because as they grew in strength and energy, their owners were unable to keep them in their living circumstances. They are very difficult to find adoptive homes for, because very few have had the patient training they need to be sociable and safe around children, other people and pets. We must be extremely selective about choosing adoptive “parents” and homes for them. Needless to say, there aren’t nearly enough responsible homes for them. So please, if one of these dogs has won your heart, look at your lifestyle as objectively as possible and decide if you really have the time to exercise and train a dog with exceptional strength and energy, the resources to feed and shelter him/her properly, and provide it a home that is safe for your own family and your neighbors’ safety. If you are a young person just getting situated, discuss this with your parents or other trusted adult who will give you help in taking an objective look at this decision. This statement, “this popularity has encouraged unscrupulous breeders to produce puppies without maintaining the pit bull’s typical good nature with people” makes it sound like breeders have successfully turned pit bulls into fighters who are aggressive toward humans and other dogs. Not true. Even a careful breeding program can’t hone desired traits perfectly, and the yahoos who are breeding pit bulls aren’t very good at selecting for traits. 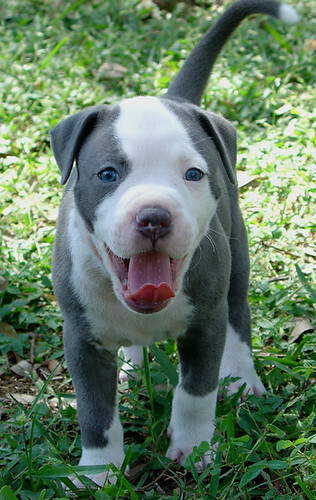 The vast majority of pits are friendly and sweet, and the number of attacks is not about genetics, or even poor training–attacks are usually correlated with chaining (and thus unsocialized, frustrated, and even hungry and thirsty dogs) and unsupervised children who don’t know how to interact with dogs. This article perpetuates the kind of stereotypes that are behind BSL and the rampant killing of pit bulls in shelters. Not helpful!!! Jeez, pick a better article, please! That statement was a quote from the ASPCA. Perhaps you should express your concerns to them, as well. This article debunks stereotypes. In case my opinion doesn’t matter (and it probably shouldn’t), you might be interested to learn that I’m hearing from Pit advocacy groups and rescues around the country who also disagree with your take on this piece. Thank you for commenting, though. Appreciate it. We would be honored to be included in your education efforts, if you’d be so kind as to provide attribution (and keep in touch!). Thank you so much! My Grandfather lost his leg in France in WWI and I’m sure if a Pitbull were there it would have been by his side as he dragged his dead friend while his own leg was hanging by only flesh!Thank You Sgt.Stubby and Thank the world for Pitbulls! Great comment– I wish I had room to include what Michael Vick’s dogs are accomplishing now. Thank you so much for adding it. I keep screaming this from the rooftops and no one is listening. People need to take personal responsibility for their lives and the lives of their pets. TOO MANY people don’t. The government steps in and legislates the responsibility right out of everyone. BSL is the perfect example. Punish the deed is the right thing to do, not the breed. Usually it is an irresponsible moron who’s handling the dog. FINE the heck out of these idiots who let their dogs attack, put in jail those who fight them (it is a felony). Make people stand up and say that they are responsible for the conduct in their lives! I have two pitts and they are the best dogs ever. They have never hurt my children or any other dog. Its not the dog that is bad it is the owner for not doing their job. Any dog can be mean if thats what there are taught to do. So how about lets punish the owner not the dog! Thanks for the article Anna. As the parent of a rescued pit, it is appreciated! I too think it is an excellent article as, from what I have learned so far, this breed’s predominant enemy is the ignorance of people. Pawzitive Petz-would like to know more about how you got involved in education for these guys! I own a 2 year old pit, an australian shepard bulldog mix & a 10 week old pit puppy.these are the smartest, sweetest, easiest to train animals I have ever had.theyre amazing with children & also very protective of me & my home.they have never bitten anyone nor have they tried.the label this breed gets is not fair or right.puppies & dogs shouldn’t have to take the blame for irresponsible breeders. i would first like to say that i really like the article…on that note i just want to say that i agree pits are such a sweet loving and very loyal dog. sadly we just ours after 11 long years and he was wonderful in every way. anyone who says that are a bad breed or dangerous around kids obviously doesnt know what they are talking about because as a mother of six children myself i have to say after having him (scar), he was not just a dog but a member of our family and i would in a heartbeat have another one. they are so protective and gentle with kids especially if raised with them and taught proper behavior…its because of idiocy, stupidity, moronic behavior from adults who have no morals or compassion for the feelings of these beautiful animals that they have the bad rap they do today and i would encourage anyone who is not educated about this to do so, who knows maybe a heart will be touched and dogs life saved…they deserve a chance at life just the same as we do…God tells us to love all living things!!!! We do not need breed banning in USA we need owner and breeder legislation. I have a pressa canario which is often mistaken for a pit. He was rescued from starvation by a kindly vet from a “breed ban” city in Washington. Buster is such a sweet kind dog, he is often attacked by other dogs when we go on walks or at the beach or puppy park. He simply ignores it, he is amazing with children, every kids favorite dog. In spite of this people often confront me about owning the breed. Once at a dog show I was asked to leave the golden retreiver booth (when a golden snapped at us) and told I should be responsible…what ever that meant. Dogs are like children a product of their upbringing and to say a breeed is bad is equal to saying all teenagers are bad because some of them join gangs and are destructive. I’ve been around pit bulls for years and have been overwhelmed by their ability to forgive even the most horrific treatment. (Not anything I did, just to make that clear.) We put my girl down this last April and I still miss her little groans and grunts of contentment at night. Thank you for this wonderful article. I rescued a pit mix 8 months ago and she has been the most loving dog I’ve ever had. I immediately began training her once I had her and we continue to work on training every day. I cannot imagine being told I couldn’t have her based solely on her appearance/breed. I take my responsibility as a dog owner very seriously and strongly feel that those owners who deliberately train their dogs (not just pits) to fight, leave them chained up 24/7, do not socialize them, etc need to be held accountable. Don’t punish me for their actions. Oh my, that was so refreshing!!!! I can’t thank-you enough! Nice to see the facts and not the myth (again) in print. Don’t forget Petey. He was the white pit bull that you saw with one black patch over his eye on the Our Gang shows. He was loyal and gentle, and he was a part of all of our history. This is an incredible story thanks for your reporting. Last year, we adopted a Brindle Pitbull, we call her Baby, and thru-out the last year, we have entertained other dog “socials” and have come to know alot of the “Bully” breeds. They are really misunderstood. If only everyone could see what i have come to experience with Baby. She has a wonderful disposition, and loves to cuddle. Just as of all her friends we have met. They are nothing but cuddly love-bugs! Lyn, Nikki’s friend. HI Nikki! I have a pit bull and a corgi, and my pit bull is less aggressive than my corgi, and neither of them have hurt anybody. Actually my friend accidentally punched my pit bull in the face and he hid from her for the rest of the night in his crate. Poor baby. Don’t ban the Breed. Ban bad owners. Our Pit Bulls are the most gentle and loving dogs we have ever had. I love my Gracie, who is a pit mix rescue dog. She’s the sweetest, most loving and smartest dog we have, not to mention she’s full of personality and fun. I wouldn’t give her up for anything in the world. I am 70 years old. I have had dogs all my life. All kinds of dogs. The only one that was aggressive was a mutt. One day I picked up a stray pit bull. That day changed my life. I lost him last May and I cannot stop grieving. I have never had a dog like him. When I found him, he was all torn up. The vet said he had been fighting and to be careful. I took him home anyway to meet my 3 other dogs. He loved them; they loved him from day one. I have a new pit now. He is 9 years old and clearly has had a very hard life. Nonetheless he is as mellow and sweet a dog as you could find. Give these dogs a break. They are not responsible for what brutal humans have done to them. Balls of energy and love. I’ve never heard a better description of a pit. My baby turns 1 yr old next week and he’s the sweetest, most playful, most sociable puppy ever. I don’t think he’d know how to fight if someone wanted him to. He’s all play, and all mischief, and all love all the time, and a bit of a bed-hog… and I wouldn’t have it any other way.